As what must have been the earliest show on this Friday evening, Andy Ditzler’s CD release show, along with an art exhibit that was simultaneously held at the Eyedrum, drew in a parking lot full of supporters and curiosity-seekers alike. 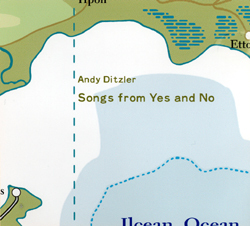 Tonight was a special performance, as Ditzler was performing songs from his new album Songs from Yes and No with a full band. Although many of Ditzler’s pieces would work fine with simple piano or light instrumental accompaniment, the pure delirious excess of a full band fleshed out his quirky and free-floating vignettes to the point where a label like “dinner theater rock” may have been most appropriate. Frequently assuming different characters and channeling various situations both profound and ordinary, Ditzler has a nearly operatic grasp of storytelling through song. In a little less than an hour, Ditzler and his band ripped through a great deal of the material on his album. He performed lively renditions of "Economics," "What Language is That," and the show closer "Just the Six of Us." And yes, he did encourage full audience participation at times. Occasionally preceding his songs with lengthy monologues, which frequently contained direct quotes from the lyrics, Ditzler was attentive to the audience’s every response and took command of their reactions. Ditzler uses his songs to bridge the gap between what he feels he can communicate to the audience and where he wants to take him. Though some moments - such as a truly surreal karaoke of "Great Hits from the ‘80s, ‘90s, and Today" during "Just the Six Of Us" and the nasal accusations of "What Language Is That" - practically dare the audience to refuse to take any of this seriously, Ditzler wrings genuine pathos out of the least likely moments of lunacy. It may be equal parts acting, musicianship, and stand-up comedy, but it’s a combination that is very much at home at the Eyedrum even as it flies in the face of the more restrained art rock the venue champions.